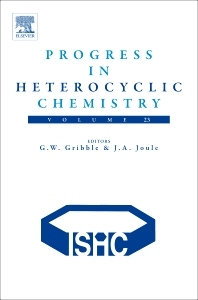 Progress in Heterocyclic Chemistry (PHC) is an annual review series commissioned by the International Society of Heterocyclic Chemistry (ISHC). Volumes in the series contain both highlights of the previous year’s literature on heterocyclic chemistry and articles on emerging topics of particular interest to heterocyclic chemists. The chapters in Volume 23 constitute a systematic survey of the important original material reported in the literature of heterocyclic chemistry in 2010. As with previous volumes in the series, Volume 23 apprises academic/industrial chemists and advanced students of developments in heterocyclic chemistry in a convenient format. John Arthur Joule did his BSc, MSc, and PhD degrees at The University of Manchester, obtaining his PhD in 1961. He then undertook post-doctoral work at Princeton University and Stanford University, before joining the academic staff of the Chemistry Department at The University of Manchester in 1963, where he is currently a Professor. In 1996 he received an RSC Medal for Heterocyclic Chemistry.